The German Real Estate market is experiencing a constant upswing since several years. International investors play a crucial role as property buyers in Germany. Huge players such as Unibail-Rodamco or BNP Paribas push the market in Frankfurt, Berlin, Munich, Cologne and other large cities. However, there are numerous investment companies and asset managers from Germany that account for a large portion of the market as well. If you are targeting the German Real Estate market, local players should not be overlooked. However, identifying the right companies is going to be difficult for foreign asset and investment managers who are top informed not yet. This is where ResearchGermany comes into play. We know the German market like the back of our hands and conduct comprehensive research in order to provide the best information possible. Our research team compiled an overview of the most important German Real Estate investors which can be used in order to get a first impression of the market or to generate new leads. You will save tons of time of exhausting research. 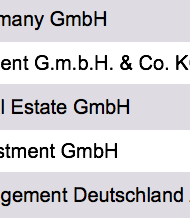 Our list offers detailed, well researched information about the most important German Real Estate Investors. You will be able to directly speak to the Investors through E-Mail, Mail, Phone or LinkedIn.